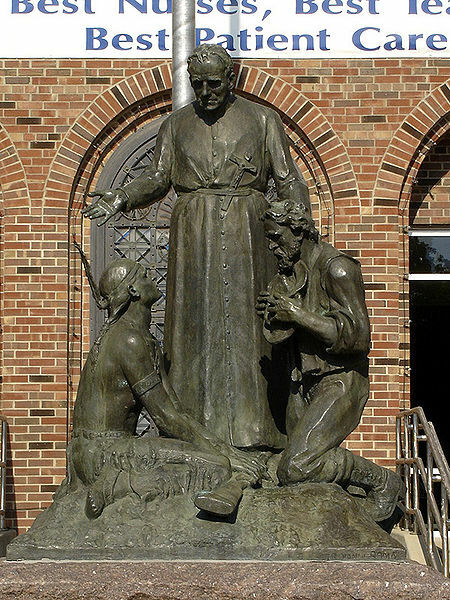 A Native American lays down his gun at the feet of Father Francis Xavier (Franz) Pierz and literally looks up to him, while a man of European descent, kneeling, doffs his hat and bows his head. Statue unveiled in 1952, the centennial of the beginning of Pierz’s ministry in Minnesota. Artist unidentified. St. Cloud Hospital. St. Cloud, Minnesota. The stories we understand about our past have been shaped by the fierce competition between church denominations to claim the souls of people living in Minnesota –and the equal intolerance of those who felt no need for the proffered forms of salvation. Early missionary churchmen were some of our most prolific recorders of written history. Financially supported by the faithful members of their denomination “back home” (the Eastern United States, Switzerland, Austria), missionaries regularly wrote letters and reports chronicling their successes, writing inspirationally about their struggles –in general, offering wholesome, instructive stories that reflected well on their denomination. This was perfectly acceptable in the mid-19th century, when religion (Christian forms, at least) was tolerated, and sometimes even viewed as necessary, in the public sphere. But by the early twentieth century, publicly practiced religion fell out of vogue with historians. People were no less religious. But religion was increasingly viewed as a personal, private matter. Historians who practiced a faith system –not all did –worked hard to personify “objectivity” by keeping their own religious worldview out of the story. This clinical, scientific approach to history led them to discount the degree to which worldview infected the cleric-authored documents which they increasingly interpreted as straight-forward, documentary chronicles of early Minnesota. It was a peculiar logic: Remain wary of politicians’ assertions. But men of God answered to a higher power; they could not lie. Perhaps not deliberately. But churchmen were not immune to the human condition. Just like the rest of us, they filtered everything through their own, unique rose-colored glasses. Today, one of the more promising tasks ahead of us in history is unfiltering the a-religious, “objective” story we’ve inherited from the historians of the early 20th century. There are thousands of documents to read and reinterpret in light of the worldview the author brought to the record. As Lois Glewwe observed in her comment on “The Prison is One Great School,” 19th century churchmen are obliging subjects. They left us lots of evidence about their worldview in their letters. Which brings me to this one. On April 15, 1863, Father Franz Pierz sat down to write a report to his superiors at the Vienna-based Board of Directors of the Leopold Foundation for Aiding Catholic Missions in America. He opened with a long, positive, report on Catholic missions among the Ojibwe in northern Minnesota in which he credited himself with averting an August 1862 rebellion planned by an Ojibwe chief, Hole-in-the-Day. Then, in the space of one page, Pierz indicted Protestant missionaries, German Turners, and Dakota warriors alike for the 1862 Dakota War. “Although the Sioux Indians who live in West Minnesota do not belong to my mission jurisdiction and therefore, should not be prominent in my mission report, I wish to mention in passing their barbarous cruelties in their revolutionary fury in order to further a kinder judgment of conditions. This poor, wild Indian nation, which has been under the negligent care of Protestant missionaries, who are well payed, for 10 years, has not received any religious training at all. Therefore, the destructive rebellion, which was brought about by similar causes as the one among the Ojibways, raged with such barbarous cruelties against the white inhabitants that only one cry, namely to destroy them, was heard; for they had committed robbery and murder against the white settlers in several regions, but especially had they practiced great atrocities in the German town of New Ulm and had murdered practically all the inhabitants and burned the town. The objects of Pierz’s diatribe –Protestants, Turners, and Dakotas –were not above dissing Catholics, and each other, in the name of faith. Like Pierz, the evidence of their worldview lies pretty close to the surface if we simply go back and read the stories they recorded in context. Does it make a difference in how we understand history? Yes. Unless you’re convinced that Hole-in-the-Day really laid down his gun at Pierz’s word and the Germans of New Ulm worshiped sacred cows. For more on Pierz, who is widely credited with attracting German Catholic settlement in central Minnesota, including bringing in the Benedictine order, see Sister Grace MacDonald’s biography, “Father Francis Pierz, Missionary” published by the Minnesota Historical Society in 1929. MacDonald quotes at length Pierz’s version of the Hole-in-the-Day story. For more about the predjudice against “heathen” New Ulmers, see ….And So Were German Turners. This entry was posted in Doing Historical Research, German Turners, Religion. Bookmark the permalink.